KARACHI: In New Karachi, hundreds of people have been forced to risk their lives crossing the road since a pedestrian bridge collapsed 15 days ago. On December 29, a dumper truck hit the footbridge across the 40-metre-wide Sharae Usman � one of the busiest roads in Karachi. A 20-meter-section of the bridge, above the lane going toward Nagan Chowrangi from Power House, was dismantled for repairs. It has been closed for public since then. The bridge has been welded but has to be put up again. �The bridge will be fixed within a few days. We only have to install it and that will be done shortly,� said Muhammad Athar, the senior director of Karachi Metropolitan Corporation�s transport and communications department. 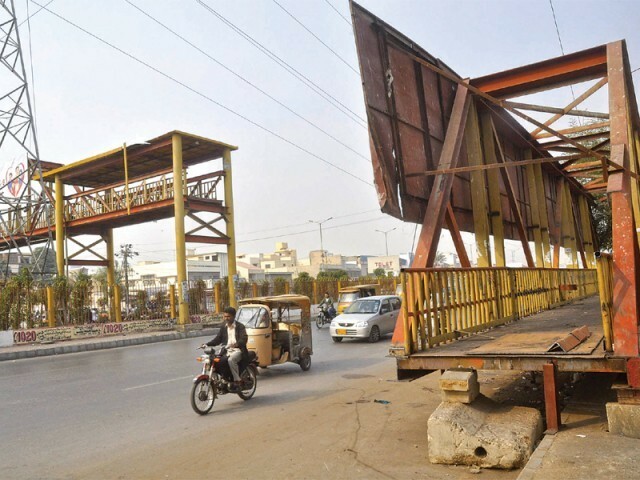 The damaged bridge, in front of Saleem Centre, runs across one of Karachi�s five signal-free corridors � roads that are meant for fast-moving traffic. The five corridors include Sharae Faisal, Rashid Minhas Road, University Road, Karsaz Road to Habib Bank Chowrangi in SITE and Sharae Quaideen. �Footbridges are necessary on such corridors,� KMC�s Athar said. Around 80 footbridges have been built in Karachi and the KMC is spending increasing amounts every year to build more to curb the rise in traffic mishaps. There are plans to construct 18 more bridges on different roads during the current fiscal year, which will end in June. Over 400 pedestrians are killed every year in Karachi alone � most of them on the National Highway, Sharae Faisal and the Korangi Industrial Area Road, according to the Road Traffic Injury Research and Prevention Centre. Last year, KMC spent around Rs260 million on building 16 footbridges but faced criticism that pedestrians hardly use them. Many bridges were constructed at locations decided on whims without proper studies, some officials point out. The KMC�s transport and communications department does not even have the figures of how many pedestrians use a particular road in a day.